1. If it's yellow, let it mellow (and of course, if it's brown flush it down). 2. No nakey butts at the dinner table. Just throw some underwear on, dude. 3. If you're outside it's socks off or shoes on. It's just that easy. 4. Play first, homework later. 5. No vomiting on the astro-turf. 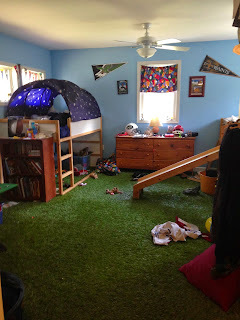 Yes, that bedroom has astro-turf on the floor. And no vomit. Ha! Ours are almost exactly the same, plus No talking during Jepordy.